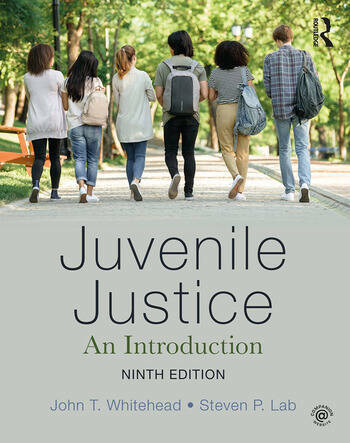 Juvenile Justice: An Introduction, Ninth Edition, presents a comprehensive picture of juvenile offending, delinquency theories, and the ways juvenile justice actors and agencies react to delinquency. Whitehead and Lab offer evidence-based suggestions for successful interventions and treatment and examine the prospects for rebalancing the model of juvenile court. This new edition includes insightful analysis and the latest available statistics on juvenile crime and victimization, drug use, court processing, and corrections. Recent developments include the possible influence of biosocial factors on delinquency; use of social media both for recruiting gang members and for combatting gangs; new probation models; responses to cyberbullying; the renewed emphasis on status offenses; the implications of drug legalization; police shootings; and specialty courts for teens and those with mental illness. Chapter 12 has been recast to cover specific information on prevention programs in addition to restorative justice approaches. Each chapter enhances student understanding with Key Terms, a "What You Need to Know" section, and Discussion Questions. Links at key points in the text show students where to get the latest information. John T. Whitehead is Professor Emeritus and former Chair in the Department of Criminal Justice and Criminology at East Tennessee State University. He completed his M.A. at the University of Notre Dame and earned his Ph.D. in Criminal Justice from the University at Albany. He has published articles about corrections, probation, and the death penalty. He is co-author of Report Writing for Criminal Justice Professionals and is currently working on an ethics textbook. Steven P. Lab is Professor of Criminal Justice at Bowling Green State University. He holds a Ph.D. in Criminology from the Florida State University School of Criminology and Criminal Justice. Lab is the author or co-author of five books, co-editor of one encyclopedia, and the author of more than 50 articles or book chapters. He is a past editor of the Journal of Crime and Justice. Lab has been a visiting professor at the Jill Dando Institute of Crime Science of the University College London and at Keele University in Staffordshire, England, as well as a Visiting Fellow at Loughborough University (England) and a Research Consultant with the Perpetuity Research Group at Leicester University (England). Lab is also a past president of the Academy of Criminal Justice Sciences.